Modak is a sweet dumpling popular in India. It is specially made to offer Lord Ganesha during festival of Ganesh Chaturthi. 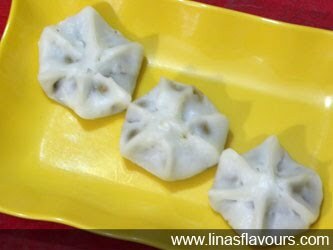 It is either stuffed with sweet fillings or made with sweet Khoya. Take a pan and heat ghee. Add poppy seeds, coconut and saute it for a minute. is melted and mix properly. Switch off the gas stove as soon as it dries. Take a pan and heat water. Add ghee, salt and sugar. Let it come to the boil. well and switch off the gas stove. Let it cool slightly. water and knead it again. Make small balls and cover the dough with a cloth. Grease your hand with ghee and take a ball. Flatten it with your fingers to make a puri. if there is any extra dough.Press it again to give the perfect shape. Boil the water in the steamer, steam the modaks for 10-12 minutes on a low flame. Finally, drizzle few teaspoons of ghee on modaks. Note: You can store this modaks for 2 days.